If you enjoy winning loads of cash and determining the amount of jackpot that you can win then Boss the Lotto is the game for you. Select a range of lottery balls of varying quality and try to find out more and separate the good from the bad. 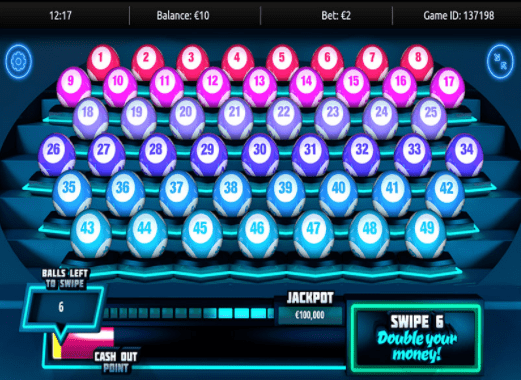 Pick all the good ones and you could be winning a significant proportion of the jackpot. Choose from 49 balls but be aware that one bad ball will means it’s the end of the line in this highly-realistic lotto game. Don't forget to check out these slot games today. Gamevy boasts unique games your customers will love. An award-winning, licensed supplier and operator they produce a select range of high quality, real-money online slots games designed to appeal to a broad demographic of the lottery and bingo players. With a belief in combing skill, chance and life-changing jackpots Gamvy aim for the ultimate in fun. Boss The Lotto. Intrigued? Yep, me too. So a little investigation and I learn it comes from Gamvy. It has a possible jackpot of a million, and... Wait, what?! Yes, we both read that right. If you are in the mood for something different, and the possibility of landing some serious, life-changing money, check out Boss The Lotto. Here we are looking at a lottery-style game primarily based on chance. This is one of a few attractive elements considering lottery-type games are few and far between online. Graphically, it is good to look at, very stylish and contemporary in appearance using an eye-pleasing black and blue colour mix. With a hi-tech soundtrack bopping in the background and selected accompanying sound bytes it comes to together to present a high-grade game and plenty of entertainment. On firing up the game you are first asked to set your bet, this begins at 1.00 up to 10.00. Your initial bet amount dictates the final Jackpot, 1.00 creates a 500,000 jackpot building to a possible 5,000,000. Then you go into the main game where you are faced with racks of ping-pong style balls. All are numbered, 1 to 49 and sit on banked levels. They are coloured accordingly, starting with numbers one to eight, the top row is pink, graduating down the rows through purple to a baby blue. Forty-three of the balls are good - six are bad. Click on a ball, anywhere, and it comes to life. Turning, the ball sinks into the platform and in its place appears a nice, green pound sign. This is a good ball. You can choose one ball at a time, pausing for each reveal, or choose six in one swipe. Trigger a black ball, at any time, and it's game over and the placement of the other five dud balls is revealed. But choose six good balls and you have the choice to continue or cash out. Beneath the game area is a light bar, running left to right, this tells you how many good balls you have chosen thus far. Should you reach the very end of this bar - Jackpot! Bear in mind this is no easy feat, but it’s possible and great fun trying! Another box tells you the next win amount, should you choose well. You’re wondering if I’m still choosing aren’t you - yep, and now my cash out is 50.00! I’m cashin out baby! Shame it’s just the demo, yet it is fun! Playable across main gaming platforms you will find easily. You have many more options to choose from, check out the top 10 best slots games we have listed. Outstanding. Top marks for excitement and entertainment. Boss The Lotto is clever, addictive and fun! Racking up good balls builds the excitement in anticipation of the result of your next choice. This is going to be a huge hit and has across the board appeal. It really can’t miss. If you want to discover more similar games then perhaps start off with Pandamania.